There was a New Moon this past Monday, December 2 at 7:22 pm when the Moon moved into alignment with the Sun in Sagittarius. 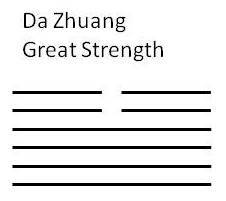 As I like to do during these important celestial events I cast an I Ching Gua, the hexagram of open (yin) and closed (yang) lines. Reading the I Ching each month is a great way to learn this ancient divination tool and offers insight into the shifting energies as we move through the calendar, the wheel of the Zodiac, the Sun’s position as we progress around it and the Moon’s position relative to Earth and Sun. All these incredible influences are at work in our lives whether we choose to believe in astrology or not! As always the energies and the yarrow stalks I use to cast the hexagram (gua) are in alignment and reveal significant information about how I am relating to these energies. My hope is that you too can relate to the gua, the sense of their meanings and how you see the alignment of your own processes with all these influences that surround you. Here is the initial gua I cast. 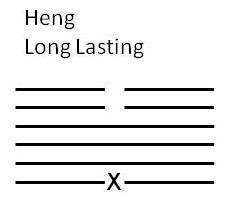 Heng meaning “long lasting,” consists of Zhen (thunder, the top trigram) over Xun (wind, the bottom trigram). Notice that the bottom line is a 6, meaning it is a changing line moving from a yin line to a 9, or yang line. This is where the change occurs, remembering that I Ching means the book of change. What is great should be righteous. The truth of Heaven and Earth can be seen. Use great strength wisely and cautiously. Don’t overdo it; rely on moral rather than physical strength. It is interesting to note that for the last New Moon in Scorpio I cast Da Zhuang as the initial gua which then moved to Guai or “eliminating.” (See the November 4 post). The mutual gua for the approached gua this New Moon in Sagittarius is Guai. We seem to be moving in a tight circle about Great Strength! PS: a wonderful astrologer friend, Gloria Hesseloff, posted this about the New Moon in Sagittarius: This is the time to question our basic assumptions and be open to new revelations and possibilities. It can be so much fun to look at life with new eyes! Doesn’t this New Moon fit so perfectly with the momentous times we are experiencing during this Shift of dire beauty? I love this phrase “shift of dire beauty”! As we examine our beliefs and assumptions the I Ching seems to be telling us to eliminate old beliefs that no longer serve, enter into new beliefs cautiously and let them grow and become long lasting with patience; they will become strong through perseverance.